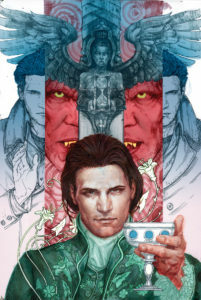 Dark Horse Comics Announces ANGEL Season 11! MILWAUKIE, Ore., (September 26, 2016)—Buffy’s first love will receive a solo series and a “re-vamped” creative team in Angel Season 11. Corinna Bechko (Lara Croft, Star Wars: Legacy II) writes Season 11 while Geraldo Borges (Deadpool, Ghost) illustrates the series, and Michelle Madsen (Buffy Season 9, Angel & Faith Season 10) colors the issues. Scott Fischer (Angel & Faith Season 10, Buffy: The High School Years) and Jeff Dekal (Journey into Mystery, Dark Horse Presents) both created covers. Angel Season 11 finds Angel being tormented by memories of his past. His visions link his dark past to a Big Bad coming in the future. The goddess Illyria intervenes and assists Angel as he discovers that it might be possible to change the future by traveling back in time to change the past. The first issue of Angel Season 11 goes on sale January 18, 2017, the day before Buffy’s birthday! Angel Season 11 will have twelve issues total. September 28, 2016 Posted by Arnie C | Comic Books, News, Television	| Comments Off on Dark Horse Comics Announces ANGEL Season 11!